Aspect ratio is a very important factor for not only DVDs, but also almost all kinds of video you would encounter in your daily lives. The most common forms of aspect ratio of a DVD are 4:3 and 16:9. In most cases, when you are burning a DVD, you will be asked to choose an aspect ratio from these two options. Although aspect ratio is crucially important for the video or the DVD, and a wrong aspect ratio could ruin the entire watching experience when you’re playing, a lot of people still don’t know which one to choose or how to change it. Today, let me explain to you the differences between the 2 different aspect ratios, and how to change a right aspect ratio of the DVD and how to set change the aspect ratio when you’re playing a video on your PC. Technically speaking, aspect ratio is the relationship of the width of a video image compared to its height. 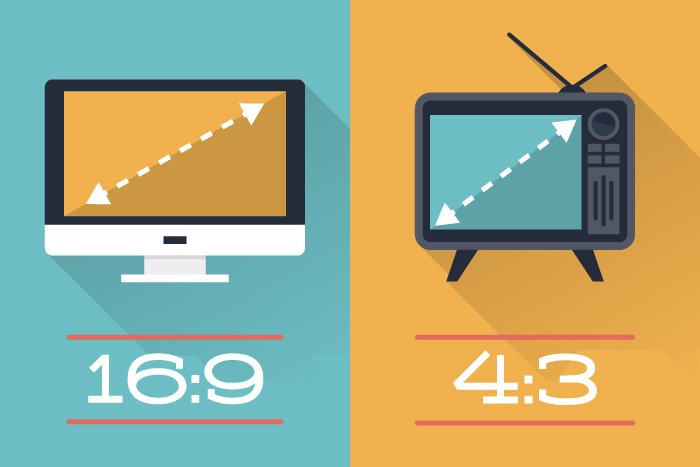 As mentioned before, the two most common aspect ratios are 4:3, also known as 1.33:1 or fullscreen, and 16:9, also known as 1.78:1 or widescreen. Ther are also some other Larger aspect ratio formats, but they are used in the motion picture industry. All the older TV’s and computer monitors you grew up with had the squarish 4:3 shape, which are 33% wider than it was high. 4:3 LCD monitors can display analog video signals that conform to NTSC and PAL standards, but they are not capable of displaying HD (high-definition) videos. 16:9 is the native aspect ratio of most high-definition LCD monitors and TV’s (16:9 and 16:10 are very similar). It is 78% wider than it is tall, and fully one-third wider than a 4:3 screen. 16:9 widescreen monitors are ideally suited to display HD video signals. Some models can also display SD (standard definition) video signals, but this will require some compromises. Generally speaking, if your computer monitor or TV set are bought in recent years, and it looks more like wide than square, then it’s 16:9 in aspect ratio. If you have some old display devices, they could be 4:3 in aspect ratio. Now you have got the general idea of what aspect ratio is and the main differences between the 2 kinds of aspect ratios, here comes the question, how to change the respect the ratio of the DVD if it doesn’t match your screen? Or how to burn the DVD in the right aspect ratio? Here is the solutions that I’m going to provide you to change the DVD aspect ratio. If you have an existing DVD with the wrong aspect ratio, you can change the aspect ratio by ripping the DVD out to a digital file using professional DVD ripping software, then change the aspect ratio of the ripped video. Here is the first step, which is how to rip your DVD to a digital file with Leawo Blu-ray Ripper. Step 1. Import Source DVD. Insert the original DVD and launch Leawo Blu-ray Ripper. On the main program interface, click “Add Blu-ray/DVD” button to import source DVD files. After this step being done, you can choose subtitles and audio tracks, play back imported media files, adjust order, edit videos, etc. Step 2. Set output format. You need to click the box next to the “Add Photo” button, and then choose “Change” to enter the “Profile” panel for selecting a profile as output format. You can add profiles to Favorite section, Custom profiles, select profiles from Format or Device tab on the Profile setting panel. Step 3. Set output directory. Click the big green “Convert” button. Then a sidebar for you to set the output directory to save the output files will appear. You can choose where you want to save your ripped movie. Step 4. Start ripping. Click the “Convert” button at the bottom of the output directory setting sidebar to start converting DVD files. You will see that all converting progress on the converting panel are presented. After the conversion is done, you will get a digital copy of your original disc with the original quality and aspect ratio. If you have done the last step, which is ripping your original DVD, or you want to burn your DVD with the right aspect ratio in the first place, what you need to do is burning the DVD after setting the aspect ratio in the burning software. Leawo Blu-ray Creator is a professional Blu-ray/DVD burning program that can easily burn all kinds of videos to a DVD disc. The advanced burning technology within the software can allow you burn your video in a highest speed and preserve the original quality at the same time. 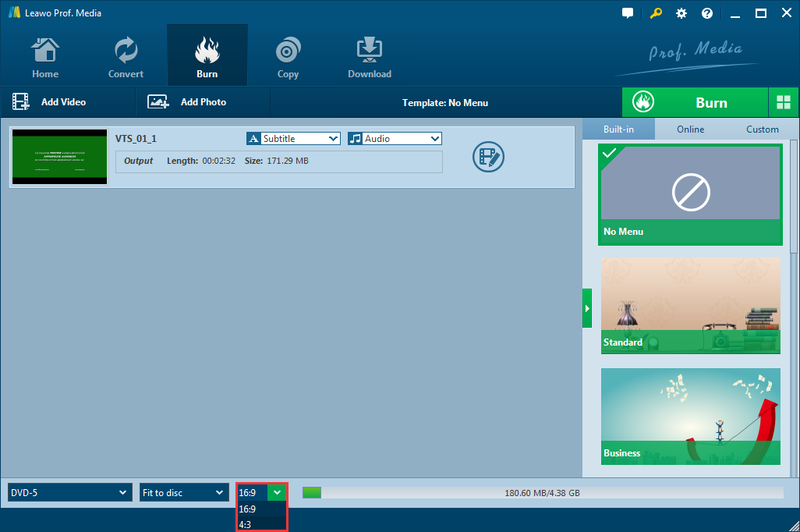 Here is how to set the aspect ratio and burn videos to Blu-ray/DVD with Leawo Blu-ray Creator. Step 2: Import your source video by clicking the “Add Video” button. 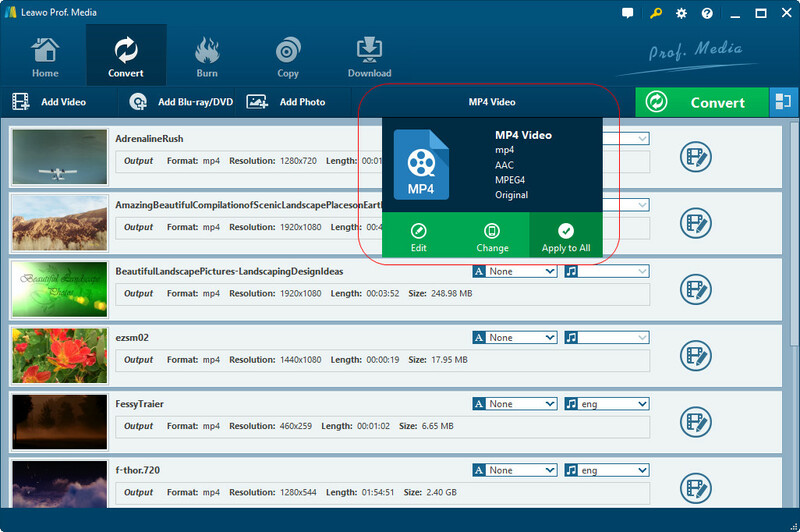 You can import a single video, ISO file or a folder. You can also drag and drop your source file to the main interface. Step 3: After importing your source video, look down, and you will find the box for you to choose the aspect ratio from 4:3 and 16:9. Step 4 (Optional):Leawo Blu-ray Creator provides some additional functions for you to burn a more personalized Blu-ray disc. If you want to do some further edits to your video, click the edit button on the video, you can trim, crop, add special effects, add watermarks, or turn 2D video to 3D in the built-in video editor. 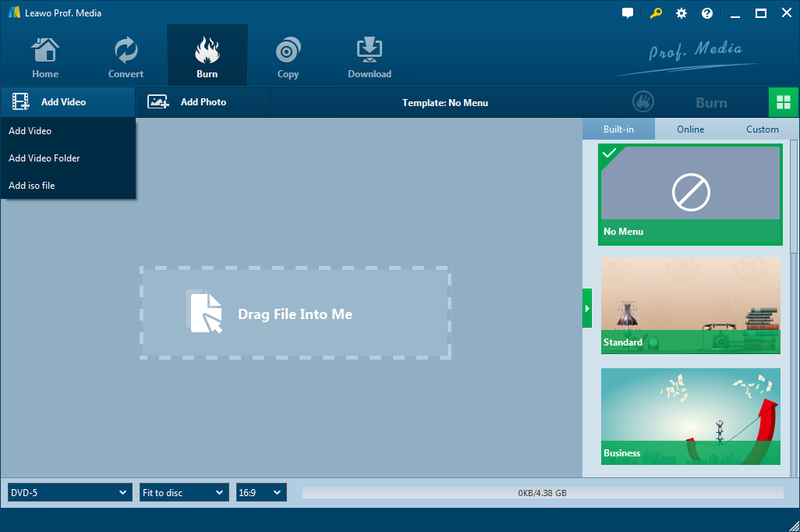 You can also create a Blu-ray menu base on the beautiful Blu-ray menu templates. Here are some additional information. If you want to play a DVD on your PC with Blu Ray or DVD player program, but the aspect ratio of your DVD doesn’t match your monitor, in most cases, you don’t have to change it like mentioned above. You can change the aspect ratio of the playback within the player program that you use. Of course, this is related to the player program that you’re actually using. Take Leawo Blu-ray Player as an example, you can change the aspect ratio of the playback with some simple settings. Here is how to do it. 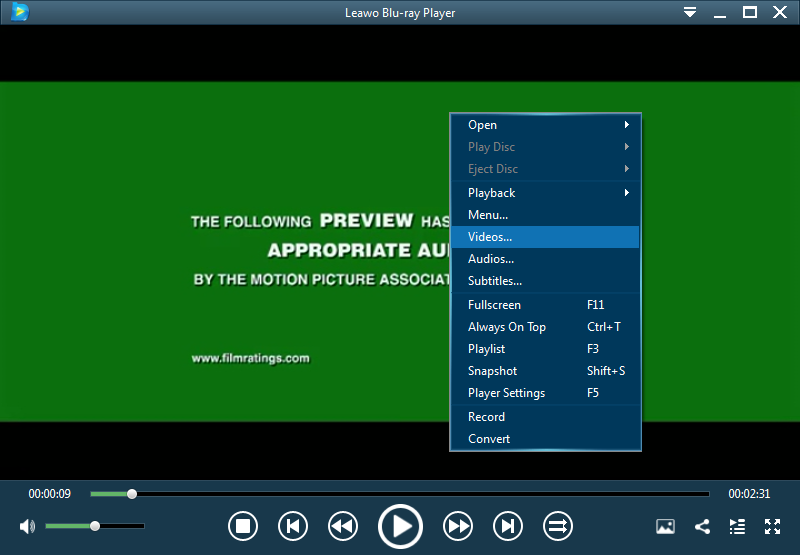 Step 1: Launch the free Leawo Blu-ray Player and import your video or movie by clicking the “Open file” button. Step 2: While your video is playing, right click on the picture and find “Videos…” to go to the video settings page. Step 3: In the video settings page, find a parameter called “View Mode”, under which you can set the view mode of the current movie playback. You can switch the aspect ratio between 4:3 and 16:9 here.